Patrons leave a Cracker Barrel restaurant and store in South Portland, Maine. But after immersing myself in numbers, maps and, admittedly, a spicy chicken sandwich, I discovered a slight problem: Neither chain’s political geography fits neatly into Todd’s heuristic. It’s tempting to associate Atlanta-based Chick-fil-A with “family values” country folk. After all, Chick-fil-A CEO Dan Cathy ignited a firestorm — and a boycott — in the summer of 2012 with a series of comments opposing gay marriage. But spend a few minutes playing with Chick-fil-A’s restaurant locator and you’ll quickly discover that Chick-fil-A’s footprint is plenty blue: There are 70 locations in California and 65 in Maryland. There’s even a Chick-fil-A in an New York University residence hall, smack dab in the middle of Greenwich Village. This year, the chain is embarking on a major expansion into urban markets. Likewise, conventional wisdom dictates that Starbucks only caters to latte-loving urban dwellers. After all, the coffee behemoth is pretty much synonymous with its Seattle birthplace and the Left Coast; its CEO, Howard Schultz, endorsed President Obama in his re-election bid in 2012. Yet with more than 11,000 U.S. stores, Starbucks has achieved a degree of ubiquity that permeates some of the reddest parts of the country. There’s even a Starbucks pouring caffeinated beverages in Mormon-dominated Utah County, Utah, where Mitt Romney won 88 percent of the vote in 2012. When I mapped Chick-fil-A’s 1,845 stores, what I found surprised me: A majority (52 percent) are located in counties President Obama won in 2008 and 49 percent are in counties he carried in 2012. On the flip side, it might surprise Todd’s viewers that 57 percent of the 976 American counties with a Starbucks voted for John McCain in 2008 and 63 percent voted for Romney in 2012. Maybe some Democrats like pickles on their chicken sandwiches after all. And maybe Frappuccinos are more popular with Republicans than we realize. But in using restaurants as proxies for the American electorate, Todd was on to something. Three years before he unveiled his Nerd Screen, I offered up a similar juxtaposition, but with Whole Foods grocery stores and Cracker Barrel restaurants instead of Starbuckses and Chick-Fil-As. 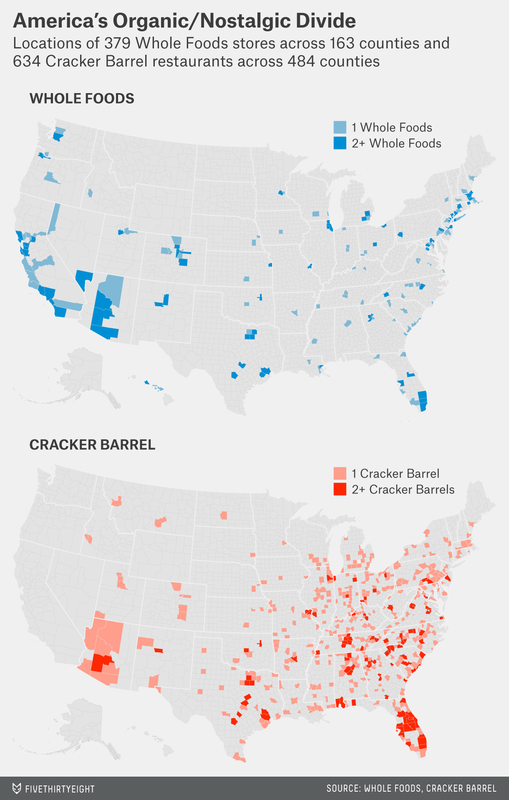 In an analysis for The Washington Post, I argued that the 2012 election amounted to a contest between well-educated, Democratic-trending Whole Foods markets and down-home, Republican-trending Cracker Barrel outposts. Austin-based Whole Foods Market and Tennessee-based Cracker Barrel Old Country Store share a few similarities. Both are adept at marketing a lifestyle, with an emphasis on “local” and “close to home.” They have similar reaches: Cracker Barrel counts restaurants in 42 states, while Whole Foods just hit its 43rd state when its Nashua, New Hampshire, market opened in August. Yet electorally, their orbits couldn’t be more divergent: In 2012, Obama won 77 percent of all counties with a Whole Foods and just 29 percent of all counties with a Cracker Barrel. What’s more, these alternate universes of culture and cuisine haven’t simply been markers of red and blue; they have been uncanny indicators of where the parties have gained and lost voters. In 1992, Bill Clinton won 61 percent of counties that now have a Whole Foods and 40 percent of counties that now have a Cracker Barrel — a 21 percent gap. As Democrats have gone out of style in Cracker Barrel country and become more fashionable in Whole Foods enclaves, that culture gap — let’s call it the “Organic vs. Nostalgic Divide” — has more than doubled to 48 percent. This divide has also proven a harbinger in midterm cycles. In 2010, when Republicans regained control of the House, 82 percent of the 66 districts they flipped from Democratic control contained a Cracker Barrel; just 20 percent contained a Whole Foods. 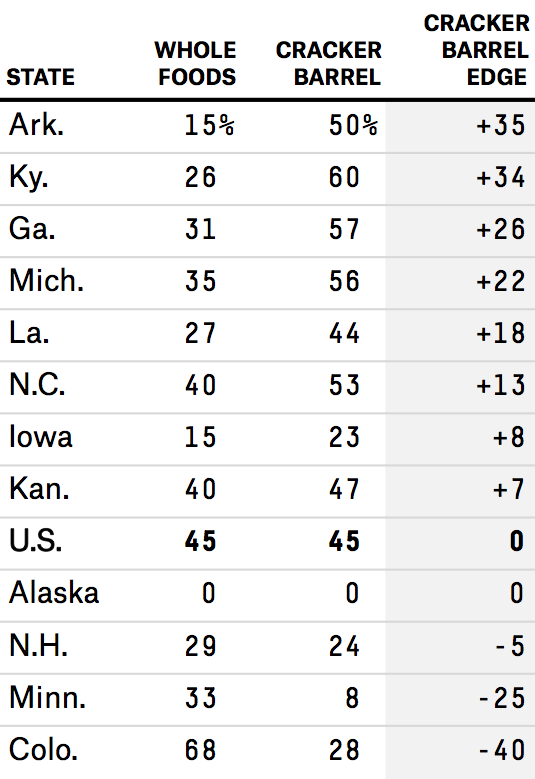 The good news for Republicans in 2014 is that most of the top 12 competitive Senate races are playing out in Cracker Barrel country more than in Whole Foods country. In fact, just three of the 12 Senate races with less than a 95 percent certainty in the latest FiveThirtyEight Senate forecast are in states where more voters live in Whole Foods counties than Cracker Barrel counties. Nationally, 44.8 percent of voters live in counties with a Cracker Barrel and 44.5 percent live in counties with a Whole Foods, roughly even. But in the average Senate battleground state (excluding Alaska, where neither chain has a location), 41.0 percent of voters live in counties with a Cracker Barrel and just 32.5 percent live in counties with a Whole Foods. That’s another indication that this year’s Senate races aren’t just playing out on Republican turf, they’re playing out on turf that’s trending towards Republicans over the long term. Granted, frequenting the Whole Foods hot bar doesn’t make you a liberal Democrat and pulling over to eat at Cracker Barrel on your next road trip doesn’t mean you’re a raging Republican. We all either know people — or are people — who defy these stereotypes. And counting up the number of each chain’s locations won’t tell you who will win the tight Senate contests in Colorado, Iowa or North Carolina. That’s best left up to polls, of course. Yet today’s increasingly polarized politics operate on two cultural axes: If you live in a neighborhood where Whole Foods’ brand of fresh, natural and organic has taken off in the last several decades, you likely live in a place where Democrats are on the rise. On the other hand, if you live in a community where Cracker Barrel’s brand of nostalgia and traditional American values has maintained its appeal, you likely live in a place that has gotten friendlier to Republicans. So the next time you’re tempted to simplify this midterm — or any election — as a grudge match between espresso roast and waffle fries, remember that it may be more like a struggle between organic goji and acai juice blend and homemade chicken n’ dumplings. Todd hatched the pairing as a means to simplify demographic data supplied by journalist Dante Chinni’s American Communities Project.